I’m a migrant. I left my native Scotland at 18 and haven’t lived there since. Having moved between a few different countries for study and work I now live in rural southwest France. I’ve been here for 12 years and counting. The experiences of all that moving has both exposed me to many foreigners and had me live as a foreigner among locals. That whole makes me relatively comfortable with people’s differences but also aware of my own prejudices, some more obvious to me than others. What got me thinking about all this was The Economist’s “Explaining Britain’s immigration paradox” article. The magazine does a data crunch on migration rates. It looked at the ten local authorities with the largest proportional increase in foreign-born people in the ten years from 2005 to 2015. The analysis showed a link between the increase in the number of migrants and the likelihood of residents to vote “Leave” in the 2016 Brexit referendum. The accompanying article was useful enough. The author got beyond the attitude of “Brexit voters are stupid racists” analyses that are common amongst EU supporters. Yet I found the comments section more helpful in challenging those prejudices I mentioned earlier. I read them with my open-borders, pro-immigration hat on, trying not to write off their authors as racist. It’s easy for me, as someone who has gained hugely from serially migrating, to be critical and dismissive of anti-immigration arguments. Label the arguers as haters and move on, nothing to discuss here. It’s much harder to read their arguments and to understand something of the people making them. The article’s sub-title is “Migration is good for the economy. So why are the places with the biggest influxes doing so badly?” Where the piece fails is in ignoring the gulf between an economy doing well – within the hair-brained metrics we use to measure economy – and how little that benefits poorer people, most people even. The comments section points the error out with a vengeance. That’s why with this viral picture below, I’m more interested as a political journalist to talk to, and understand, the man on the right. He is identified as Ian Crossland of the English Defence League. 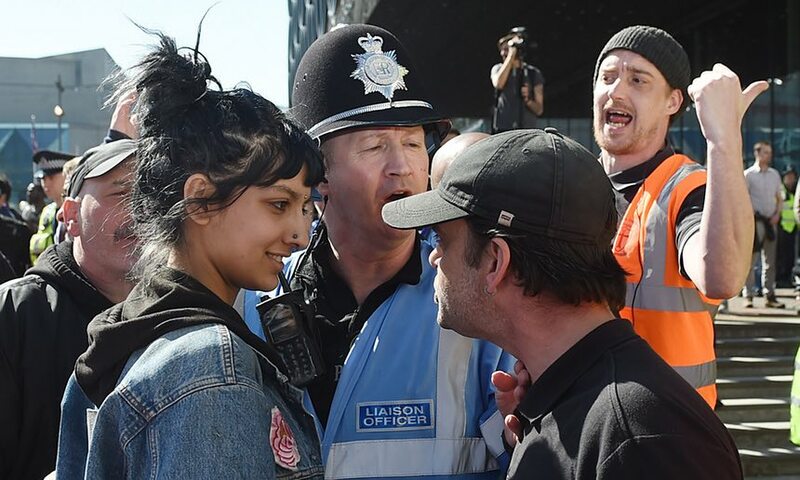 Saffiyah Khan, the young woman who stood up to his group’s anti-immigrant protest, shows remarkable courage and composure. She deserves all the praise she’s received for her example. It’s much harder to go towards those on the side I don’t personally agree with and to do so in a way that respects their right to a different point of view. It’s also more relevant to understanding, so as to help alleviate, our current state of political dysfunction.